Sometimes everything just works perfectly. Friday I was out again with my friend RJ from Northwind Outfitters. This time we were turkey hunting, a rarity for me. Turkeys don’t thrill my blood the same way ducks do, although I can understand the allure. RJ said he thought we’d have a good chance at this ranch he knew in Contra Costa County, so I took him up on the offer. Up at oh-dark-thirty I was, and in my truck by 4:10 a.m. A full Thermos of coffee downed, I was awake by the time I rolled into the ranch at 6 o’clock. RJ was there, too. I got out of the truck to shake his hand when we heard gobbling. Close. “Get your stuff on!” RJ said. Gobbling already? Must be the full moon. We were at the base of one of those sweeping green hills that make California’s Coastal Range so pretty. Wide open grass, with a smattering of oaks near the crest of the ridge. RJ’s plan was to hike up to the ridge, set up a turkey decoy or two and wait for the birds to come down from their roost tree. But with the moonlight so bright, and the turkeys obviously so close, we decided instead to set up just a a few hundred yards from the tuck, at the base of a tree that stood at the bottom of the grassy hillside. RJ stuck a couple decoys in the ground. I nestled myself against the tree, shotgun at the ready. I brought “tinkerbell,” my little Franchi veloce 20-gauge over-under, loaded with some Hevi-shot No. 6s. Not exactly textbook turkey weaponry, but hell, I figured it’d do the job. RJ started calling, making clucks like a hen turkey. We didn’t have to wait long before a turkey flew down from the roost tree. A pack of five others waddled after him in single file. Right toward the decoys. Had we hiked up that hill like RJ had initially planned, they surely would have seen us and flown away. He’d made the right call. I have to admit it was pretty cool to see all these birds approaching the decoys at a dead run. I stayed motionless as the first turkey slowed down and walked right past me at about 15 feet. 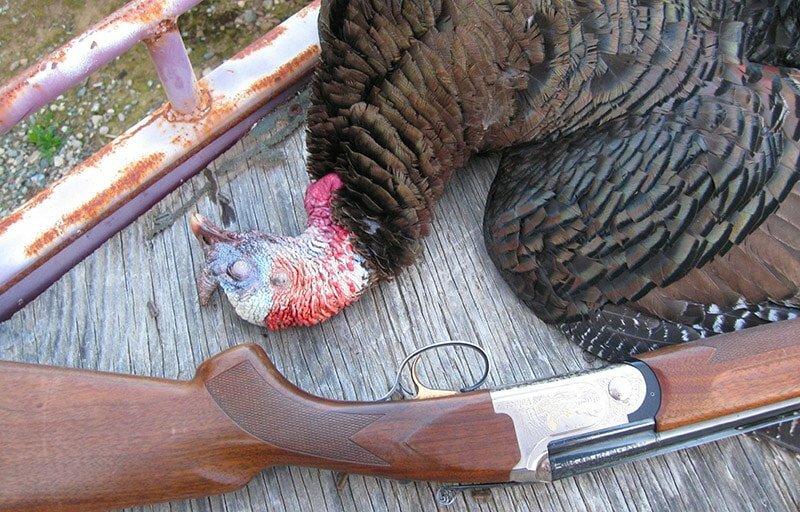 He was definitely a male — in spring, you can only shoot male turkeys — but he was pretty young. His colleagues waddled past. So close I could smell them; they smelled like dirty chickens. Then something happened. All the turkeys bunched up. It is illegal to kill more than one turkey per day in California. And while it would be cool to get a double, I could lose my hunting license with such a shot. One bird in the bunch definitely had a long beard, which meant he was the oldest male. But he was directly in front of another bird. Probably how he got so old. It only took a couple seconds, but finally one separated himself by a few feet. I’d set my top barrel to fire first, and I aimed it just above his head. I wanted to avoid plastering him with shot when he was only about 15 feet away. BOOM! The bird went down like he’d been hit with a hammer. The others stood around, startled. Had it been legal, RJ and I could have killed them all. But we just stood up instead. The turkeys got the message and ran off. I looked at the time: 7:25 a.m. Well, that was quick! I picked up the bird; RJ and I think it weighed something like 18 pounds in the feathers. For the beard-watchers out there, it’s beard was just under 5 inches. With so much daylight left, I figured I’d take care of the turkey right away. You can age turkeys like you would hang a pheasant. 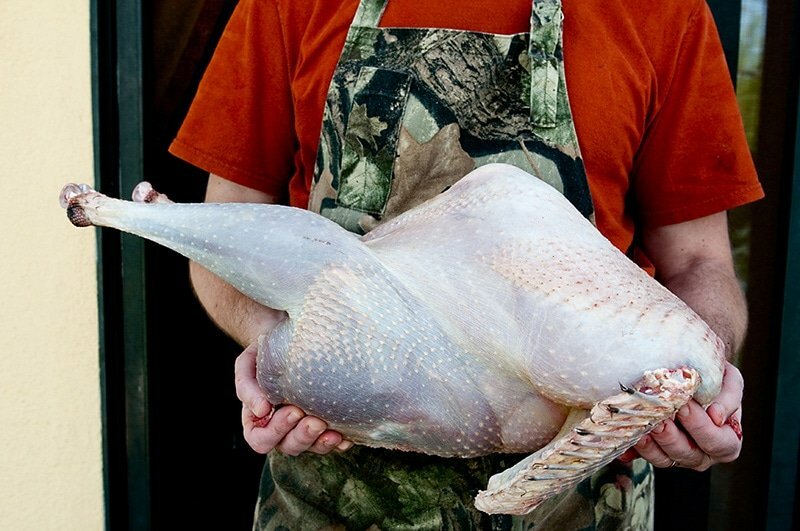 You can also wet-pluck a turkey the way you would scald a chicken, but a turkey’s skin is far stronger than a chicken or pheasant’s, so dry plucking is a better option in my opinion. Dry plucking a turkey is simple — the tough skin means you will not likely tear it — but it took me 45 minutes to pluck this bird. He looked good when I was done. Crazy shape, eh? Incidentally, my plan succeeded: The turkey had several hits to the head, and one in the back that went through some important artery. But that was it. RJ said I got lucky. I think he’s right. Now I know everyone loves their whole roast turkeys, but I don’t. I prefer to cook the breasts one way and the legs, thighs and wings another. And I make turkey broth with the carcass. Here’s a test for you: Ask someone you know which part of a chicken or turkey they like best — breast meat, or thighs and legs? My money is that anyone who chooses thighs likes food, anyone who like breasts counts calories. I am a confirmed thigh man. So that’s what I cooked first. 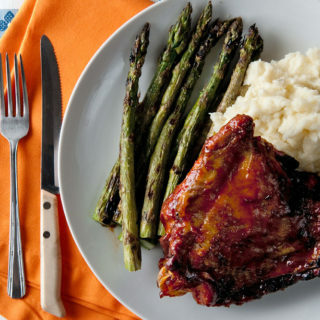 BBQ turkey legs, thighs really, as they barbecue better, with a maple-bourbon sauce. It is as awesome as it sounds, and it was a perfect way to end a perfect spring day. 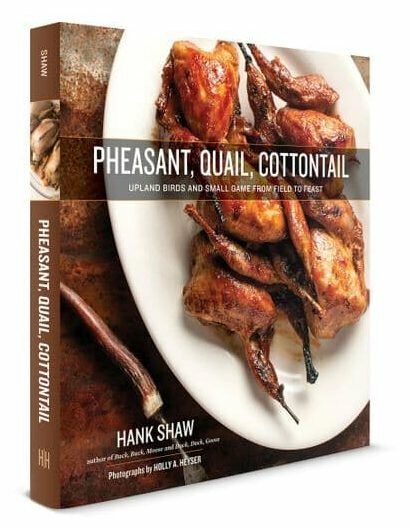 This recipe works with either domestic or wild turkey. I've found that of all the animals with a wild and domestic equivalent, turkey is the closest in flavor. A good heritage breed turkey is very similar to a wild one. But even a butterball would work well here. They key is low and slow. This is barbecue, not grilling. Set your grill up where the fire is on one side of the grill, and the turkey thighs are on the other. Cook the turkey, flipping and painting with the BBQ sauce, every 15 to 30 minutes until the meat wants to fall off the bone. This should take between 2 to 4 hours, depending on how old your bird was; and old tom could take 4 hours. Get your grill ready as described above. Coat the turkey thighs in the vegetable oil and salt well. Lay them skin side down on the cooler side of of the grill. Cover and cook until the meat is just starting to fall off the bone, flipping every 30 minutes or so to paint with the maple-bourbon BBQ sauce. Let the turkey cook without sauce while you make it. Once the turkey is on the grill, make the sauce by sauteing the grated onion in the butter for a few minutes. You don't want the onion to brown, but you do want it to cook enough to lose that raw onion smell and flavor. This should take 5 minutes or so on medium heat. Add the remaining ingredients and mix well. Boil this down by 1/3. Adjust for heat and salt. If you want, puree the sauce in the blender. I prefer to puree my sauce because it will be thicker that way. Return it to the stove top over very low heat. Stir from time to time. When the turkey is done, shift it to the ho side of the grill, skin side down, for a few minutes to caramelize the sauce. 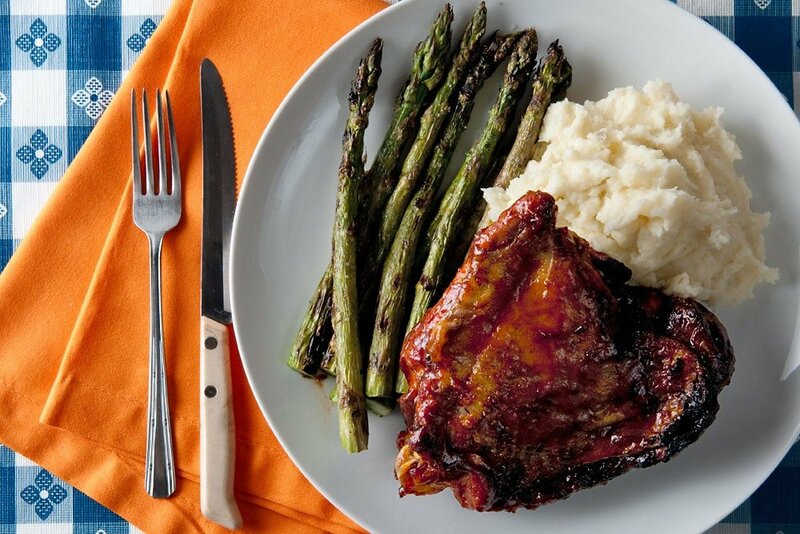 Paint with a little more BBQ sauce right when you serve. Serve with a veg and starch. Since it's spring I chose mashed potatoes and grilled asparagus. Oh, and beer is my choice here, not wine. Ryan: Hilarious. I am actually barbecuing wild turkey thighs on my Traeger Timberline tomorrow. The plan is to brine them overnight, then do a light spice rub. Set the Traeger on Super Smoke to about 225F, then let it roll. I am guessing it will take about 3 hours or so to get nice. I plan on using pecan wood, but that’s just what I have in the hopper right now.